I know that the comic is ending in less than a week and maybe now seems like an odd time to share some fan art. But, c’mon. Did you look at that thing up there? I HAD to share it. The above piece of art comes from Jesse Guiher. You can learn more about him at his web site – Tiger Tail Art. Jesse actually wrote me a few months ago asking me about some of my favorite movies. Bi-polar as I am, I remember suggesting both Vertigo and Anchorman. Little did I know that inquiry would result in this piece of fantastic art! I don’t know if there’s more that I can say about it other than I am very appreciative to have fans like Jesse who pour their heart and their talent into pieces like this. Jesse was very complimentary to me in his e-mail. 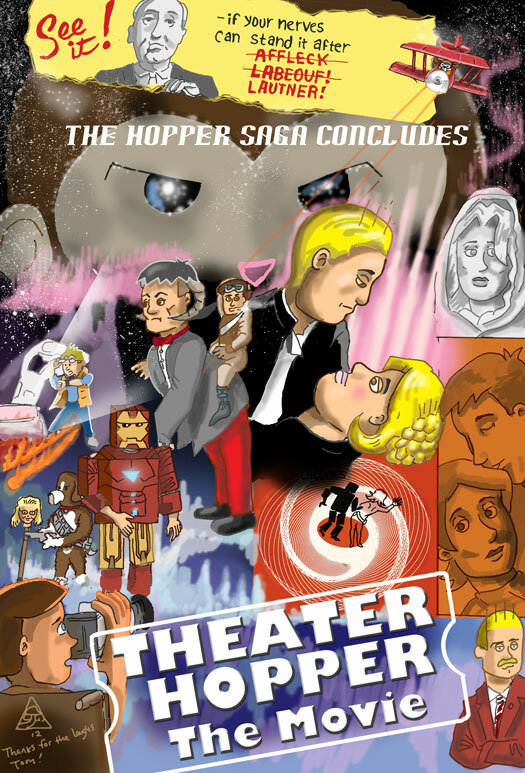 “I am sorry to see Theater Hopper going away, it was one of a handful of comic sites that influenced me to try my own hand at starting a comic on the web after sending countless submissions to syndicates over the years,” he said. My reaction to that kind of praise is to almost shy away from it. I’ve had people over the years tell me I’ve been an influence to them – which I appreciate – but I’ve never doubted for a second that these talented individuals couldn’t have made their dreams real on their own. But then you look at a piece like this and it’s kind of hard to ignore. And I am humbled further. Thanks, Jesse. And thanks to all of the fans that have kept me humble over the years. Cheers.